All these events in a child's life can have an influence on the child's development. The osteopathic follow-up will be able to help, thanks to soft techniques, to improve the disorders of the corporal learning (4 legs, walk, ...), to improve the statics of the child and its amplitude of movements. Osteopathy will also help to correct tensions, blockages or imbalances that can lead to problems with concentration, fatigue, stress, sleep disorders, .. Gentle techniques adapted to the age and morphology of each child will improve all these disorders. Collaboration with other health professionals is sometimes necessary for the overall care of children. 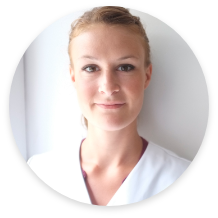 I practice rather gentle osteopathy, having a global approach and using techniques that vary according to each individual patient’s needs and reasons for consultation.